It would be stupid and simplistic to say that the clashes of 14th December were only the work of the blackblock i.e. police infiltrators amongst the demonstrators. The truth is that much more simple than the conspiracy theories of the pacifists or of the left. The truth is three and a half years since the explosion of the crisis, young people realize they don’t have a future, they are paying the cost of a crisis they haven’t produced, and that politicians and unions don’t represent them. Since this is the general feeling amongst students, it’s obvious that when the ‘extremists’ arrived at the demos with the clear intention of ‘raising the level of the struggle,’ it seemed to some there was something in what they had to say, as evidenced by two hours of warfare where hundreds were injured and twenty three people arrested for violently confronting a decadent system which daily and endlessly produces oppression, precariousness (job insecurity), redundancies, desperation, misery and war. Therefore it’s hardly surprising that these young people were pissed off and finally pushed to take part in the clash with the forces of law and order. The demos in the Piazza del Popolo showed us a clear split between the political condition of young proletarians and today’s petty bourgeoisie. The more moderate wing is bound up with institutional reality and is opportunistic (Uniti controla crisi - disobbedienti). It is weighty, especially from an organisational point of view, and although they make political noises about the redistribution of wealth, their compromises with the forces of parliament year after year show that their words are a waste of breath. The majority of the students are simply drifting, they have no link to the traditional politics of the past and are incapable of creating a proper identity for themselves, and are extremely scared about the future, which appears darker and darker. The class component in the movement is a very small minority and most of the time it doesn’t have the courage to express itself. Moreover, a lot of organised young people and groups which do have a class basis often repress it in practical daily politics, adapting themselves to the situation rather than trying to push for an increase in class consciousness. We happily salute the attempts of some students to leave the student sphere and to try and side with the interests of the working class. The hope is that these small episodes might become more generalised and mature in a class sense. The fringe of the ‘extreme Italian left’ is composed of former autonomists, some ultras, a few Stalinists and anarchists. These groups - although more accustomed to thinking in terms of class and anti-capitalism - have demonstrated through the course of things that they are incapable of developing a coherent analysis of the present and, above all, are incapable of putting forward a credible revolutionary framework for overcoming capitalism. It is especially in this last area that the events of 14th December shows these organisations carrying out the only type of practice they know, i.e. conflict on the streets. In other words their contribution is to ‘resume antagonistic confrontation’ in Italy. Solidarity stops being unconditional when we look at the 23 people who were arrested, as well as to those young people who were hurt. 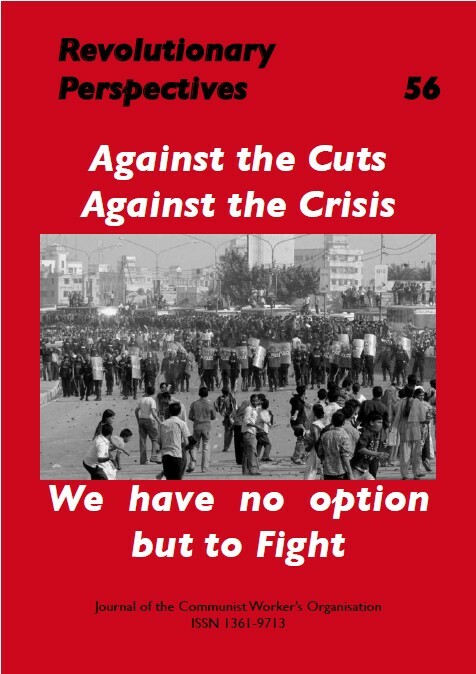 We have developed some reflections on the positive developments of the opposition movement to the cuts and the crisis. The slogans that are most common in the movement are inadequate. 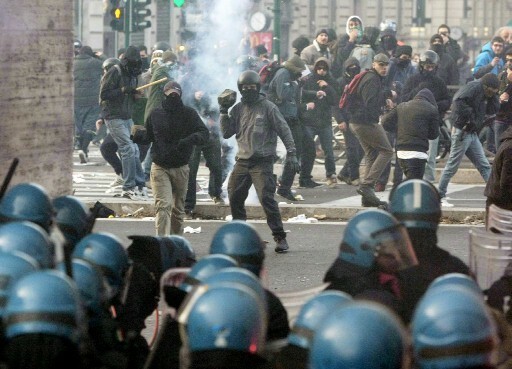 It isn’t enough to be against Berlusconi and his ministers or the forces of bourgeois repression and the police. The problem is much greater. What the organisations have to express is that the conflict has to be extended in the first place to the work place and outside of and against trade union logic. The movement needs the perspective of overcoming capitalism and its crises altogether, in other words it needs the perspective of communism. It serves little purpose to demonstrate in front of parliament when Parliament is the organisation for defending the interests of the dominant class. The movement must face with greater strength the issue of how to reach the periphery, how to get involved with the proletarians that are being hit by the crisis in order to develop the fight of the class. This must start from workplaces and from working class areas rather than simply having a discussion against capitalism and its crisis. It is not through clashes like the one in the Piazza del Popolo (such as those with anti-fascist militants) that raises the level of class consciousness, but through denouncing exploitation, through denouncing the cuts and the violence which was carried out by the ruling class in response to the problems generated by its crisis. Until then the perspective of class struggle and the necessity to supersede capitalism won’t become clear merely in the forms of conflict, and those taking part, in the clashes with the forces of bourgeois order will not be able to be in a position where they can reform the system. To take part in violent clashes doesn’t mean in itself that someone is a revolutionary, but rather can mean they give themselves over to violent means to reform (albeit in radical clothes) the system, despite their intentions. Violence is integral to the system. It is one thing to defend the demonstrations and defend the struggle in order to try and be politically anti-capitalist, (and in this case the aim of the ‘violence’ of the Piazza del Popolo was a shared one) but it’s another to take part in the life of the demonstrations only to end up literally and symbolically under parliament. In view of the lack of active participation of the communist vanguard, the confused anger that’s fermenting - not only amongst the younger generation - and it’s a generous flame of revolt, is destined to become reabsorbed into the system or repressed by it, without being able to make the indispensable leap in quality in the anti-capitalist sense. We international communists have been and always will be always fighting to raise the level of class struggle and the revolutionary consciousness of the proletariat…until this vile system is superseded once and for all.